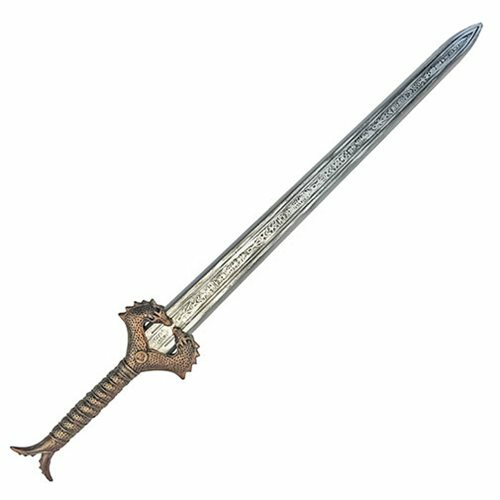 This high quality, officially licensed LARP stunt replica of the God Killer sword used by Princess Diana of Themyscira in the highly successful Wonder Woman movie is must have for fans. Copied directly from the original prop sword with exacting attention to detail, this foam sword is perfect for wowing people as a display item or for adding to a costume for a convincing roleplay! The Wonder Woman God Killer Stunt Replica Foam Sword measures about 30-inches long and is made from durable stiff foam. Like the actual prop, this sword features amazing detail including the Amazonian runic script on the fuller and the hilt captures mirrored dragons biting into the blade with reptilian armor wrapping around the handle. Ages 18 and up.